Irish flag stickers feature the green, white and orange colors of the tircolor. Irish flag stickers are suitable for any flat surface. 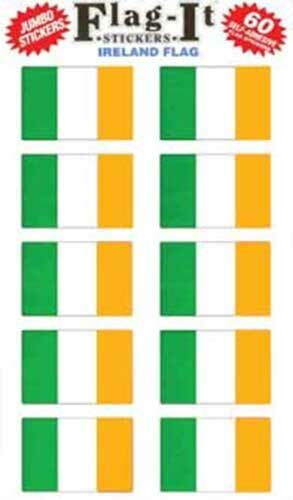 These Irish flag stickers are green, white and orange in color. The Irish stickers are self adhesive and measure 1 1/2" wide x 1" tall; there are 60 in each package. The Irish flag decals are made in the United States, and are available at The Irish Gift House. Irish decal features an early version of the Irish flag that is called the Erin Go Bragh or Fenian flag.